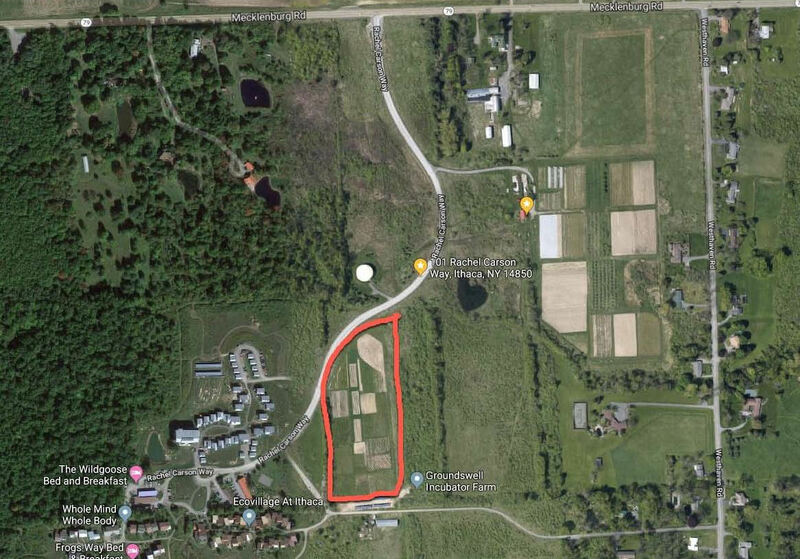 ​The Board of Ecovillage at Ithaca, Inc. (EVI, Inc.) is seeking proposals for an agricultural enterprise to take over the site of the current Kestrel Perch U-Pick Berry Farm, located on a prime parcel near the center of the Ecovillage at Ithaca in Ithaca, NY. This ag site consists of about ​4 acres surrounded by deer fencing with access to municipal water and with possibilities for additional surface water. It has been under organic-type (but non-certified) cultivation since 2000 under the care of Katie Creeger, who is retiring. ​Site includes established plantings of raspberry, blueberry, gooseberry, red and black currant, elderberry and other perennials as well as unplanted land that has been maintained with cover crops in recent years. ​EcoVillage is a mixed-use facility on 175 acres consisting of 100 homes with about 250 residents on 15 acres surrounded by 160 acres of meadows, woods and 3 other farms. It is located about 2 miles west of downtown Ithaca on Highway 79. ​Lease costs are minimal. Compensation for existing capital improvements and business goodwill would be negotiated independently with Katie. ​EVI, Inc. seeks an enterprise that helps further its non-profit goals of encouraging and demonstrating for the general public innovative ways of meeting human needs for food, shelter, community and livelihood that work in harmony with the rest of the natural world. work with you to develop it further.